June 30, 2008: The year is 1908, and it's just after seven in the morning. A man is sitting on the front porch of a trading post at Vanavara in Siberia. Little does he know, in a few moments, he will be hurled from his chair and the heat will be so intense he will feel as though his shirt is on fire. That's how the Tunguska event felt 40 miles from ground zero. 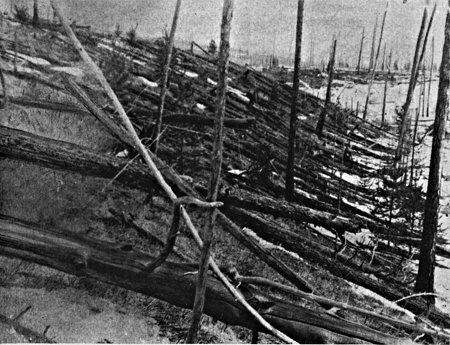 Today, June 30, 2008, is the 100th anniversary of that ferocious impact near the Podkamennaya Tunguska River in remote Siberia--and after 100 years, scientists are still talking about it. "If you want to start a conversation with anyone in the asteroid business all you have to say is Tunguska," says Don Yeomans, manager of the Near-Earth Object Office at NASA's Jet Propulsion Laboratory. "It is the only entry of a large meteoroid we have in the modern era with first-hand accounts." While the impact occurred in '08, the first scientific expedition to the area would have to wait for 19 years. In 1921, Leonid Kulik, the chief curator for the meteorite collection of the St. Petersburg museum led an expedition to Tunguska. But the harsh conditions of the Siberian outback thwarted his team's attempt to reach the area of the blast. In 1927, a new expedition, again lead by Kulik, reached its goal. "At first, the locals were reluctant to tell Kulik about the event," said Yeomans. "They believed the blast was a visitation by the god Ogdy, who had cursed the area by smashing trees and killing animals." While testimonials may have at first been difficult to obtain, there was plenty of evidence lying around. Eight hundred square miles of remote forest had been ripped asunder. Eighty million trees were on their sides, lying in a radial pattern. "Those trees acted as markers, pointing directly away from the blast's epicenter," said Yeomans. "Later, when the team arrived at ground zero, they found the trees there standing upright – but their limbs and bark had been stripped away. They looked like a forest of telephone poles." Such debranching requires fast moving shock waves that break off a tree's branches before the branches can transfer the impact momentum to the tree's stem. Thirty seven years after the Tunguska blast, branchless trees would be found at the site of another massive explosion – Hiroshima, Japan. The massive explosion packed a wallop. The resulting seismic shockwave registered with sensitive barometers as far away as England. Dense clouds formed over the region at high altitudes which reflected sunlight from beyond the horizon. Night skies glowed, and reports came in that people who lived as far away as Asia could read newspapers outdoors as late as midnight. Locally, hundreds of reindeer, the livelihood of local herders, were killed, but there was no direct evidence that any person perished in the blast. 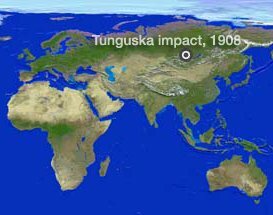 Above: The location of the Tunguska impact. "A century later some still debate the cause and come up with different scenarios that could have caused the explosion," said Yeomans. "But the generally agreed upon theory is that on the morning of June 30, 1908, a large space rock, about 120 feet across, entered the atmosphere of Siberia and then detonated in the sky." It is estimated the asteroid entered Earth's atmosphere traveling at a speed of about 33,500 miles per hour. During its quick plunge, the 220-million-pound space rock heated the air surrounding it to 44,500 degrees Fahrenheit. At 7:17 a.m. (local Siberia time), at a height of about 28,000 feet, the combination of pressure and heat caused the asteroid to fragment and annihilate itself, producing a fireball and releasing energy equivalent to about 185 Hiroshima bombs. "That is why there is no impact crater," said Yeomans. "The great majority of the asteroid is consumed in the explosion." Yeomans and his colleagues at JPL's Near-Earth Object Office are tasked with plotting the orbits of present-day comets and asteroids that cross Earth's path, and could be potentially hazardous to our planet. Yeomans estimates that, on average, a Tunguska-sized asteroid will enter Earth's atmosphere once every 300 years. "From a scientific point of view, I think about Tunguska all the time," he admits. Putting it all in perspective, however, "the thought of another Tunguska does not keep me up at night."